Paresthesia is a neurosensitivity disorder caused by injury to the neural tissue. It is characterized by a burning or twinging sensation or by partial loss of local sensitivity. Paresthesia related to endodontic treatment can occur because of extravasation of filling material or the intracanal dressing, as a consequence of periapical surgery or because of periapical infection. A literature review of paresthesia in endodontics was undertaken, with a view to identifying and discussing the most commonly affected nerves, the diagnostic process and the treatment options. Among reported cases, the most commonly affected nerves were those passing through the jaw: the inferior alveolar nerve, the mental nerve and the lingual nerve. 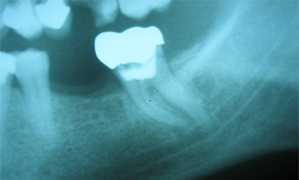 To diagnose paresthesia, the endodontist must carry out a complete medical history, panoramic and periapical radiography, and (in some cases) computed tomography, as well as mechanoceptive and nociceptive tests. To date, no specific treatment for endodontic-related paresthesia has been described in the literature, since the problem may be related to a variety of causes. Endodontic-related paresthesia must be investigated carefully because of the intimate anatomic relationship between the root apex and certain nerve bundles, especially in the jaw. In addition, if the condition is severe, an irreversible neural lesion may result. The aim of the present study was to review the literature on paresthesia as an endodontic complication and to discuss the causes, the diagnostic process, the most affected nerves and the treatment options. The nerves most affected by paresthesia related to endodontic therapy are the inferior alveolar nerve (IAN) and the mental nerve.2 However, the prevalence and incidence of paresthesia related to specific endodontic problems and particular teeth are still unknown. In a retrospective study3 examining cases of paresthesia related to treatment of mandibular premolars, the incidence was 0.96% (8/832). Yet many cases of paresthesia can go unnoticed by the endodontist and are therefore not reported. NOTE: Click to enlarge images and tables. Figure 1: Periapical radiograph of a second mandibular molar showing the close relationship between root tips and mandibular canal. With regard to endodontic treatment as a cause of paresthesia, Rowe8 suggested that the nerve can be damaged directly during root canal therapy through over-instrumentation (Fig. 1). However, Rowe also argued that mechanical damage to the nerve caused by an endodontic instrument can be repaired during the healing process and that this form of paresthesia is generally temporary. 8 The possibility of paresthesia due to extrusion of microorganisms should be considered, given the potential for biological aggression, although this mechanism has not been explored in the literature. For this systematic review, the PubMed database was searched, using the keyword combination “endodontic AND paresthesia,” for all case reports of paresthesia associated with endodontic complications published over the past 10 years (from January 2002 until December 2012). A total of 40 cases were identified (Table 1). Some important cases published earlier than the defined period of the search are also discussed in the following text. Few cases of paresthesia related to endodontic complications involving innervation of the upper arch have been reported in the literature. Orr22,23 described 2 patients with paresthesia of the maxillary nerve caused by extravasation of N2 paste (Indrag-Agsa, Bologne, Italy). Orr emphasized that the composition of N2 paste includes paraformaldehyde, which is extremely caustic. Reeh and Messer24 described paresthesia that occurred during retreatment of a maxillary central incisor; in this case, perforation of the apex led to extravasation of sodium hypochlorite (NaOCl) into the periradicular tissues. The consequences of this incident were immediate pain and swelling, formation of a sinus tract and paresthesia in the lower orbital and nasal regions. Pelka and Petschelt25 presented another case of paresthesia caused by extravasation of NaOCl, which was inadvertently injected beyond the apical foramen of the upper left lateral incisor, producing paresthesia of the left facial and infraorbital nerves. During the performance of in vitro studies, Schwarze and colleagues26 observed that sealers/pastes containing paraformaldehyde, such as Endomethasone (Specialités Septodont, Saint-Maur, France) and N2, are more cytotoxic and mutagenic than sealers containing calcium hydroxide. Tilotta-Yasukawa and colleagues11 determined the proximity of the apex of the premolars and molars in relation to the mandibular canal, as well as the relationship between the IAN and its corresponding artery, with the goal of understanding how endodontic filling material spreads through the bone to penetrate the mandibular canal. They observed that the distance between the dental apex and the mandibular canal was more variable (and generally greater) for the first molar than for the second and third molars (1–4 mm vs. less than 1 mm [35 cases in 40 mandibles examined]). The authors concluded that, in the posterior region, the mandibular bone is not very dense and has a greater amount of trabecular bone. Notably, the inferior alveolar artery itself may be related to the occurrence of paresthesia, since it can act as a route for dissemination of materials, microorganisms and irrigating solutions to the neural tissue. Figure 2: Schematic representation of the various causes of paresthesia due to endodontic problems. From the second premolar to the third molar, typical causes are extrusion or diffusion of intracanal medications, periradicular surgery, overfilling and overinstrumentation (beyond the apex), and apical periodontitis. Diagnosis of paresthesia or neural anesthesia is based on a complete medical history, with assessment from the onset of symptoms.6 Reactions of the affected area to thermal stimuli, mechanical action, and electrical or chemical tests also contribute to the diagnosis, although these responses are subjective. Periapical radiographs are essential to establishing the relationship between the dental apex and certain nerve endings, especially in the mandible (Fig. 3). De Beukelaer and colleagues30 reported the use of sensitivity tests to detect the extent and severity of paresthesia. Mechanical, thermal and taste tests were carried out at regular intervals, revealing the progress of treatment. According to these authors, clinical examination of patients who report a lesion of the lingual nerve should begin with observation of nerve function, specifically pronunciation and swallowing. Palpation of the sensitized region should also be performed. Two types of clinical neurosensitivity testing can be performed, according to the specific receptors that are stimulated through skin contact: mechanoceptive and nociceptive. Mechanoceptive testing is based on a light static touch and the directional brush stroke test, whereas nociceptive testing is based on observation of thermal sensation experienced when specific groups of sensory nerve fibres are stimulated, in addition to the touch sensation evoked by sharp instruments. Figure 3:a) Jaw showing bone in the molar region. b) Higher magnification of the alveolar bone in the third molar region, notable for the presence of numerous vacuoles. c) Jaw illustrating the possibility of bacteria or endodontic materials or products diffusing through the vacuole to reach the inferior alveolar nerve (shown in red). Figure 4: Overfilling of sealer bordering the cortex of the mandibular canal. Because paresthesia related to endodontic problems has a wide variety of causes, no single protocol can be used to treat every case. The treatment options for paresthesia are described below according to the causative situation. For decompression of the IAN, favourable results have been achieved by first carrying out sagittal mandibulectomy for better visualization of the mandibular canal and then removing extraneous materials, with or without a root-end resection. Microneurosurgical techniques, which involve the use of microinstruments and magnifying equipment, can be used to restore the function of certain sensory or motor nerves innervations.32 The indications and contraindications for microneurosurgery are listed in Table 2. Pogrel33 suggested exploratory surgery immediately after diagnosis of trauma in the neural tissue, since observations from a radiographic exam and other diagnostic techniques cannot be used to define the extent of damage to the nerve. This author suggested that the waiting time for intervention is controversial and that repairs carried out soon after the injury are more successful than those that are delayed; however, it was also noted that some interventions performed 12 months after the trauma had been successful. According to Schultze-Mosgau and Reich,35 the likelihood of spontaneous recovery from paresthesia over a period of 3 to 6 months is too long. These authors suggested that vitamin B complex be prescribed to promote the development of the myelin sheath of nerves. The following precautions are suggested to prevent paresthesia associated with endodontic problems: perform a thorough radiographic examination, verifying the proximity of the radicular apexes and/or periapical lesions to the nerve structures; maintain appropriate working length, avoiding over-instrumentation and excessive dilatation of the apical foramen; irrigate with chlorhexidine in cases of a very broad or incompletely formed apex; and administer B vitamins immediately if extrusion of filling material or solution is discovered close to the nerve. In general, paresthesia occurs soon after endodontic therapy; therefore, it is recommended that the endodontist follow up with patients to inquire about symptoms within the first 24 hours after the appointment. This practice may allow early identification of paresthesia, thus facilitating effective treatment. The nerves most affected by paresthesia are those located in the jaw, specifically the IAN and the mental nerve. To diagnose paresthesia, the endodontist should perform anamnesis, nociceptive and mechanoceptive tests on the affected region, periapical and panoramic radiography, and, in some cases, cone-beam CT. The choice of treatment modality should take into consideration factors such as the cause of the paresthesia, the extent of the injury, the time elapsed since the onset of symptoms and the patient’s responses to systemic administration of medications. To prevent paresthesia, the endodontist should be aware of the proximity of the apexes of the teeth to the nerve structures before initiating intracanal procedures. Dr. Alves is professor, department of endodontics, faculty of dentistry, Estácio de Sá University, Rio de Janeiro, RJ. Dr. Coutinho is specialist in endodontics, São Leopoldo Mandic, Rio de Janeiro, RJ. Dr. Gonçalves is professor, department of endodontics, faculty of dentistry, Estácio de Sá University, Rio de Janeiro, RJ. Acknowledgment: This study was supported by grants from Fundação Carlos Chagas Filho de Amparo à Pesquisa do Estado do Rio de Janeiro (FAPERJ), a Brazilian governmental institution. The authors have no declared financial interests. Giuliani M, Lajolo C, Deli G, Silveri C. Inferior alveolar nerve paresthesia caused by endodontic pathosis: a case report and review of the literature. Oral Surg Oral Med Oral Pathol Oral Radiol Endod. 2001;92(6):670-4. Cohenca N, Rotstein I. Mental nerve paresthesia associated with a non-vital tooth. Endod Dent Traumatol. 1996;12(6):298-300. Knowles KI, Jergenson MA, Howard JH. Paresthesia associated with endodontic treatment of mandibular premolars. J Endod. 2003;29(11):768-70. Ozkan BT, Celik S, Durmus E. Paresthesia of the mental nerve stem from periapical infection of mandibular canine tooth: a case report. Oral Surg Oral Med Oral Pathol Oral Radiol Endod. 2008;105(5):e28-31. Ahonen M, Tjaderhane L. Endodontic-related paresthesia: a case report and literature review. J Endod. 2011;37(10):1460-4. Di Lenarda R, Cadenaro M, Stacchi C. Paresthesia of the mental nerve induced by periapical infection: a case report. Oral Surg Oral Med Oral Pathol Oral Radiol Endod. 2000;90(6):746-9. Skaper SD, Facci L, Leon A. Inflammatory mediator stimulation of astrocytes and meningeal fibroblasts induces neuronal degeneration via the nitridergic pathway. J Neurochem. 1995;64(1):266-76. Rowe AH. Damage to the inferior dental nerve during or following endodontic treatment. Br Dent J. 1983;155(9):306-7. Yaltirik M, Ozbas H, Erisen R. Surgical management of overfilling of the root canal: a case report. Quintessence Int. 2002;33(9):670-2. Gallas-Torreira MM, Reboiras-Lopez MD, Garcia-Garcia A, Gandara-Rey J. Mandibular nerve paresthesia caused by endodontic treatment. Med Oral. 2003;8(4):299-303. Tilotta-Yasukawa F, Millot S, El Haddioui A, Bravetti P, Gaudy JF. Labiomandibular paresthesia caused by endodontic treatment: an anatomic and clinical study. Oral Surg Oral Med Oral Pathol Oral Radiol Endod. 2006;102(4):e47-59. Scolozzi P, Lombardi T, Jaques B. Successful inferior alveolar nerve decompression for dysesthesia following endodontic treatment: report of 4 cases treated by mandibular sagittal osteotomy. Oral Surg Oral Med Oral Pathol Oral Radiol Endod. 2004;97(5):625-31. Zmener O. Mental nerve paresthesia associated with an adhesive resin restoration: a case report. J Endod. 2004;30(2):117-9. Vasilakis GJ, Vasilakis CM. Mandibular endodontic-related paresthesia. Gen Dent. 2004;52(4):334-8. Poveda R, Bagan JV, Fernandez JM, Sanchis JM. Mental nerve paresthesia associated with endodontic paste within the mandibular canal: report of a case. Oral Surg Oral Med Oral Pathol Oral Radiol Endod. 2006;102(5):e46-9. Pogrel MA. Damage to the inferior alveolar nerve as the result of root canal therapy. J Am Dent Assoc. 2007;138(1):65-9.
von Ohle C, ElAyouti A. Neurosensory impairment of the mental nerve as a sequel of periapical periodontitis: case report and review. Oral Surg Oral Med Oral Pathol Oral Radiol Endod. 2010;110(4):e84-9. Gonzalez-Martin M, Torres-Lagares D, Gutierrez-Perez JL, Segura-Egea JJ. Inferior alveolar nerve paresthesia after overfilling of endodontic sealer into the mandibular canal. J Endod. 2010;36(8):1419-21. Gambarini G, Plotino G, Grande NM, Testarelli L, Prencipe M, Messineo D, et al. Differential diagnosis of endodontic-related inferior alveolar nerve paraesthesia with cone beam computed tomography: a case report. Int Endod J. 2011;44(2):176-81. Marques TM, Gomes JM. Decompression of inferior alveolar nerve: case report. J Can Dent Assoc. 2011;77:b34. Lopez-Lopez J, Estrugo-Devesa A, Jane-Salas E, Segura-Egea JJ. Inferior alveolar nerve injury resulting from overextension of an endodontic sealer: non-surgical management using the GABA analogue pregabalin. Int Endod J. 2012;45(1):98-104. Orr DL 2nd. Paresthesia of the second division of the trigeminal nerve secondary to endodontic manipulation with N2. Headache. 1987;27(1):21-2. Orr DL 2nd. Paresthesia of the trigeminal nerve secondary to endodontic manipulation with N2. Headache. 1985;25(6):334-6. Reeh ES, Messer HH. Long-term paresthesia following inadvertent forcing of sodium hypochlorite through perforation in maxillary incisor. Endod Dent Traumatol. 1989;5(4):200-3. Pelka M, Petschelt A. Permanent mimic musculature and nerve damage caused by sodium hypochlorite: a case report. Oral Surg Oral Med Oral Pathol Oral Radiol Endod. 2008;106(3):e80-3. Schwarze T, Leyhausen G, Geurtsen W. Long-term cytocompatibility of various endodontic sealers using a new root canal model. J Endod. 2002;28(11):749-53. Koseoglu BG, Tanrikulu S, Subay RK, Sencer S. Anesthesia following overfilling of a root canal sealer into the mandibular canal: a case report. Oral Surg Oral Med Oral Pathol Oral Radiol Endod. 2006;101(6):803-6. Littner MM, Kaffe I, Tamse A, Dicapua P. Relationship between the apices of the lower molars and mandibular canal--a radiographic study. Oral Surg Oral Med Oral Pathol. 1986;62(5):595-602. Denio D, Torabinejad M, Bakland LK. Anatomical relationship of the mandibular canal to its surrounding structures in mature mandibles. J Endod. 1992;18(4):161-5.
de Beukelaer JG, Smeele LE, van Ginkel FC. Is short-term neurosensory testing after removal of mandibular third molars efficacious? Oral Surg Oral Med Oral Pathol Oral Radiol Endod. 1998;85(4):366-70. Solar P, Gahleitner A. [Dental CT in the planning of surgical procedures. Its significance in the oro-maxillofacial region from the viewpoint of the dentist][Article in German] Radiologe. 1999;39(12):1051-63. Zuniga JR, LaBanc JP. Advances in microsurgical nerve repair. J Oral Maxillofac Surg. 1993;51(1 Suppl 1):62-8. Pogrel MA. The results of microneurosurgery of the inferior alveolar and lingual nerve. J Oral Maxillofac Surg. 2002;60(5):485-9. Barkhordar RA, Nguyen NT. Paresthesia of the mental nerve after overextension with AH26 and gutta-percha: report of case. J Am Dent Assoc. 1985;110(2):202-3. Schultze-Mosgau S, Reich RH. Assessment of inferior alveolar and lingual nerve disturbances after dentoalveolar surgery, and of recovery of sensitivity. Int J Oral Maxillofac Surg. 1993;22(4):214-7.